A tasty seafood dish of blue crabs cooked in coconut water, tomato sauce and coconut meat. Young coconut meat and water are good source of vitamins and minerals. Coconut water is also refreshing and drinking it often will cleanse our system specially the kidneys. When it comes to cooking, it gives dishes a distinctive taste compared to just using water or broth. To cook crabs with buko; Saute garlic and onion. Add crabs, buko water, 1 teaspoon iodized salt or 1 tablespoon rock salt. Simmer for 10 minutes. Remove crabs. Discard shell and gills. Cut into half. Flake meat from claws. Return to pot. Add sitaw and buko meat. Simmer for 5 minutes. Add Del Monte Tomato Sauce. Simmer for another 10 minutes. Add green onions just before serving. Saute garlic and onion. 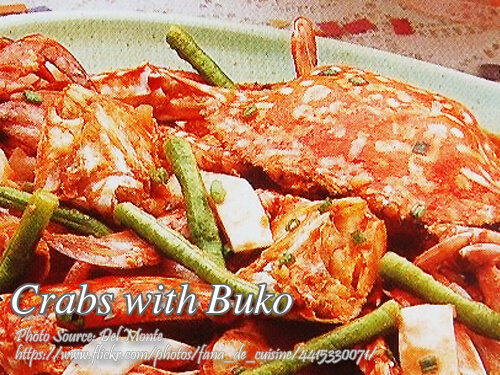 Add crabs, buko water, 1 teaspoon iodized salt or 1 tablespoon rock salt. Simmer for 10 minutes. Remove crabs. Discard upper shell and gills. Cut into half. Flake meat from claws. Return to pot. Add sitaw and buko meat. Simmer for 5 minutes. Add Del Monte Tomato Sauce. Simmer for another 10 minutes. Add green onions just before serving.